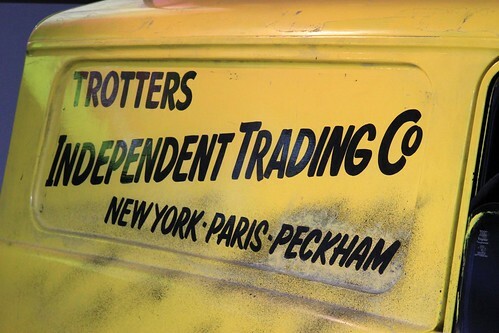 Possibly the nation's most famous three-wheel vehicle, this Regal van (mistakenly referred to as a 'Robin') featured in the BBC sitcom Only Fools and Horses. It was the sole transport for the Trotter family of Del, Rodney, Grandad and Uncle Albert until Del Boy later went upmarket and purchased a Capri Ghia. What a plonker! 105,824 Regal vans and saloon cars were produced by Reliant between 1963 and 1972. The bodywork was of all glass fibre unit construction. With a maximum loading capacity of 50 cubic feet, one example was driven in 1968 around Mallory Park racing circuit with sixteen peeple crammed in the back! Cushtie! Housing a collection of over 250 automobiles and motorcycles telling the story of motoring on the roads of Britain from the dawn of motoring to the present day, the award winning (Winner - The International Historic Motoring Awards of the Year 2012) National Motor Museum appeals to all age groups. From World Land Speed Record Breakers including Campbell’s famous Bluebird to film favourites such as the magical flying car, Chitty Chitty Bang Bang and rare oddities like the giant orange on wheels. Don’t miss exciting extra features such as the Motorsport Gallery, Wheels and Jack Tucker's Garage - A permanent, multi award-winning 1930's garage has been created within the Museum, complete down to the last nut and bolt and rusty drainpipe. Whilst the building is a complete fabrication, everything in it - all the fixtures, fittings, tools and ephemera - are genuine artefacts collected over a period of 25 years. This is the last photo from my visit.